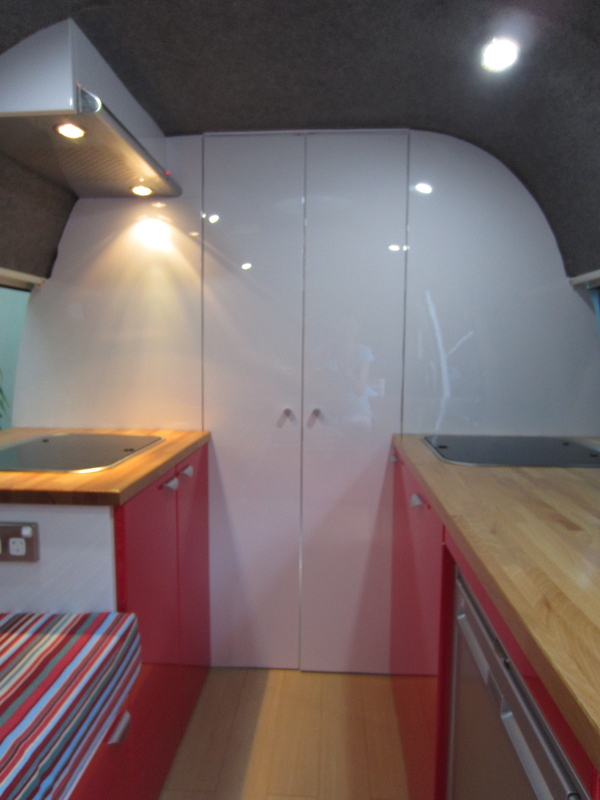 Well the deadline was Christmas, and apart from a few final tweaks, our campervan is finished. YAY! We still need to finish some edging, paint the inside of the back door and make some tiebacks (ribbon will do for now, in keeping with the season) but this can all wait until the Christmas break. 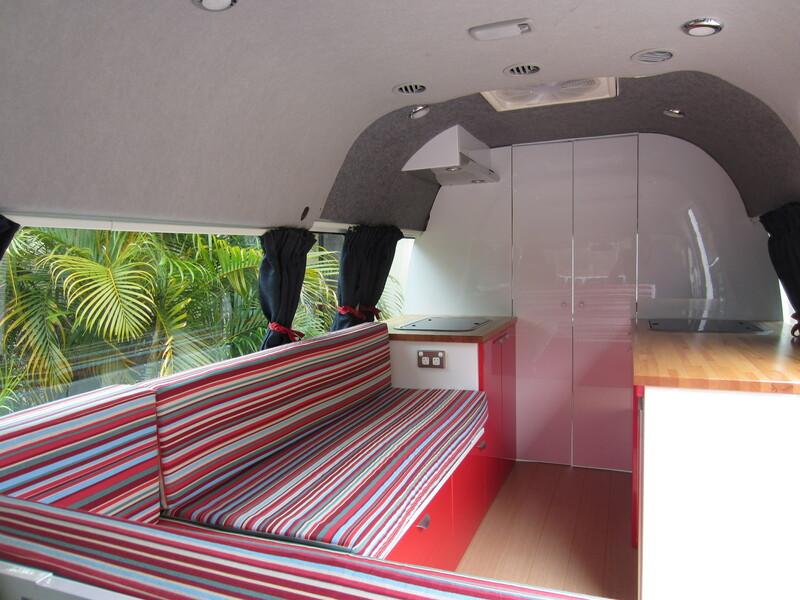 Of course I’m biased, but I think Paul has done a stunning job – the van is unrecognisable from its days as a minibus and I can’t wait for lots of campervanning mini-breaks. 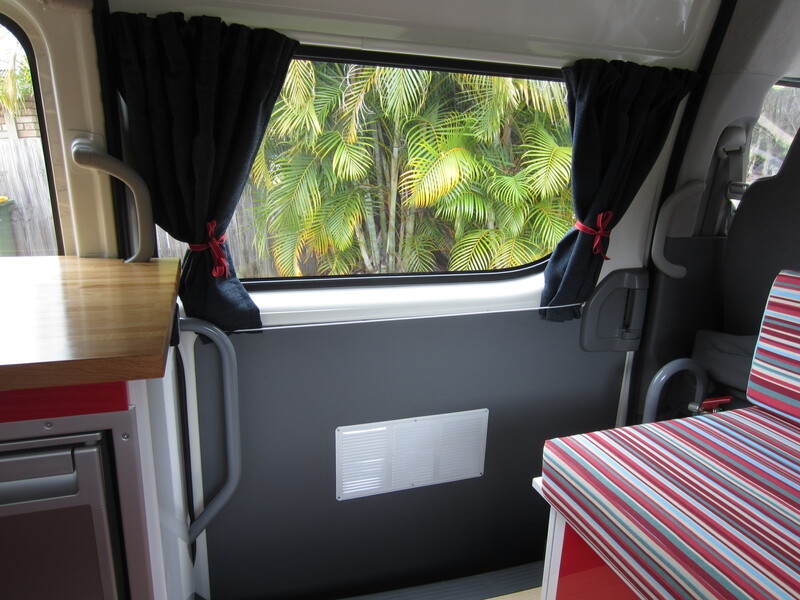 And the maiden voyage is not far off; we’ve booked one night on North Stradbroke Island at a beachside campsite called Adder Rock. We’re hoping the name is not prophetic, but just in case we’ll be requesting a pitch far from any rocks. We’ll let you know how it goes. Merry Christmas everyone! 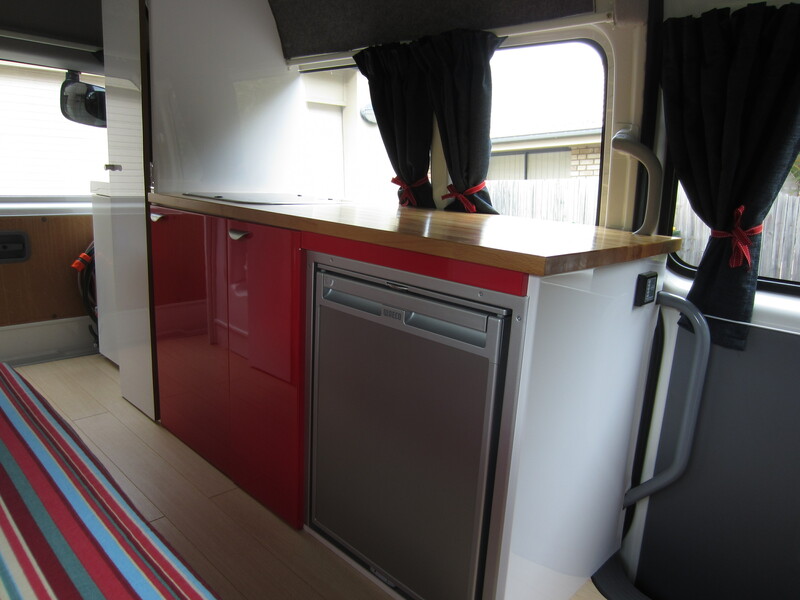 This entry was posted in Building a diy campervan, Campervan - the finished result! and tagged build a campervan, campervan cabinets, Campervan conversion project, campervan kitchen, Campervan photos, converting a campervan, Converting a campervan step-by-step, DIY campervan by Rach. Bookmark the permalink. It looks absolutely brilliant Rachel and Paul – quite amazing! Have a great time. Wow, fantastic! Well done. The van really has come along very nicely. I love the colour scheme. You have the same fridge as me. I hope you enjoy the wine. Thanks very much Darren! 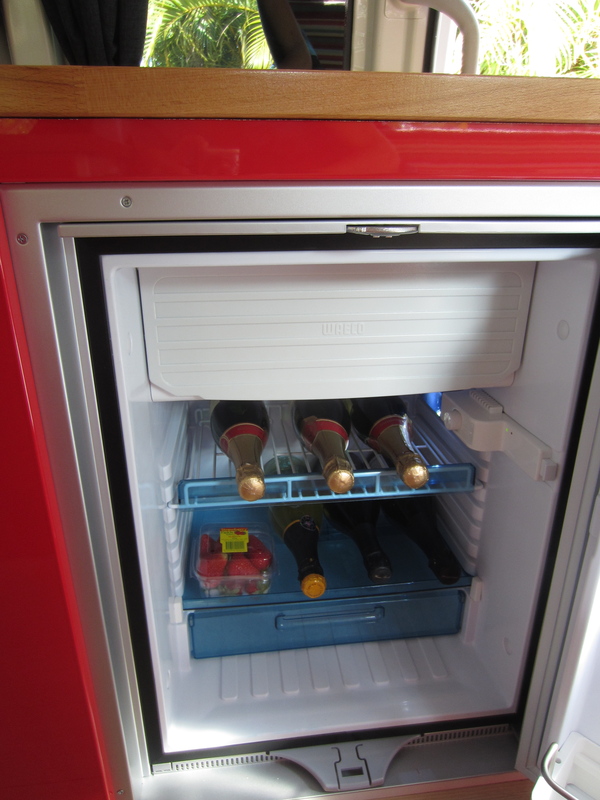 The fridge is great, really spacious – we had to replace most of the wine with a slightly less liquid diet though sadly! Excellent Job……….well done you two!!! You deserve a break – enjoy the weekend away. Thanks Neil – it was great to have a break away from my unpicker, although Paul was suffering withdrawal symptoms from his drill, he didn’t know what to do with himself! 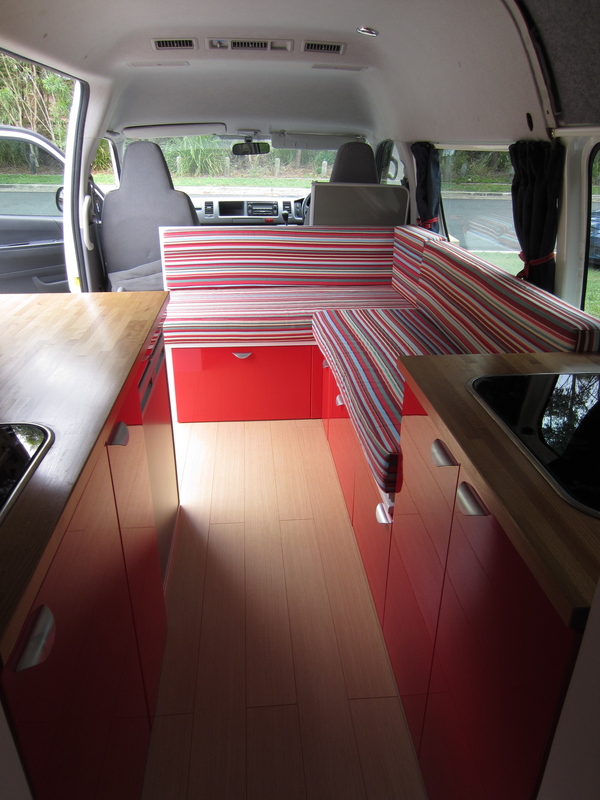 What a fantastic job both you and Paul have done to the campervan. We’re looking forward to seeing you both over the festive holiday. Thanks Richard! We did crack open a bottle of champagne over the bonnet when we arrived, I might suggest we turn that into a tradition at the start of every trip! See you soon. I trust the recent rain is not putting you off camping ?????? 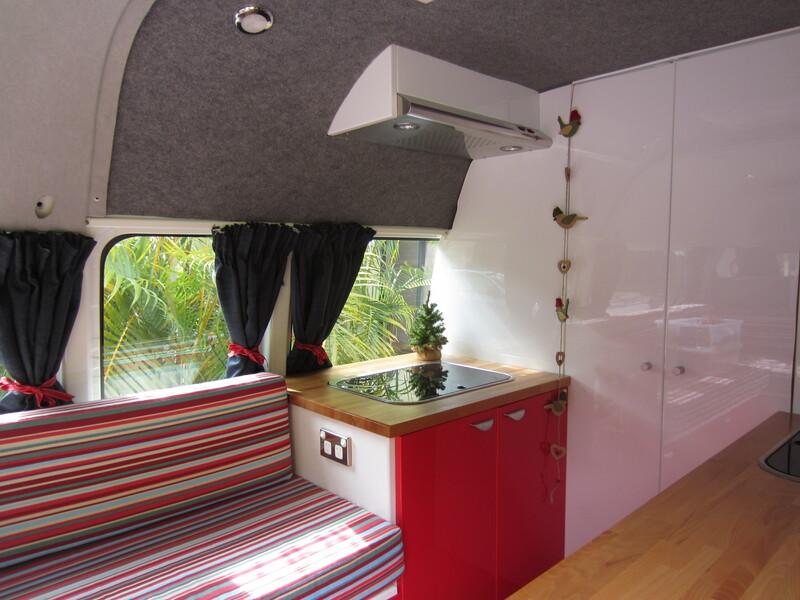 A brilliant campervan conversion by a couple in QLD. I will be referring back to this blog regularly to see how they did things. If Kevan turns out even half as good as this, I will be beaming with pride! It won’t be as posh though, they have a proper fridge, stovetop with an extractor fan, proper curtain railings, proper wooden floorboards and a wooden benchtop, and a BATHROOM! Kevan just isn’t that big. Thank you Rachel & Paul for sharing your wisdom. Wow! This looks brilliant. I love the seat covers. It looks very modern. I’ve just found your blog so I’m having a look around. Sounds great. Rach and Paul, brilliant! 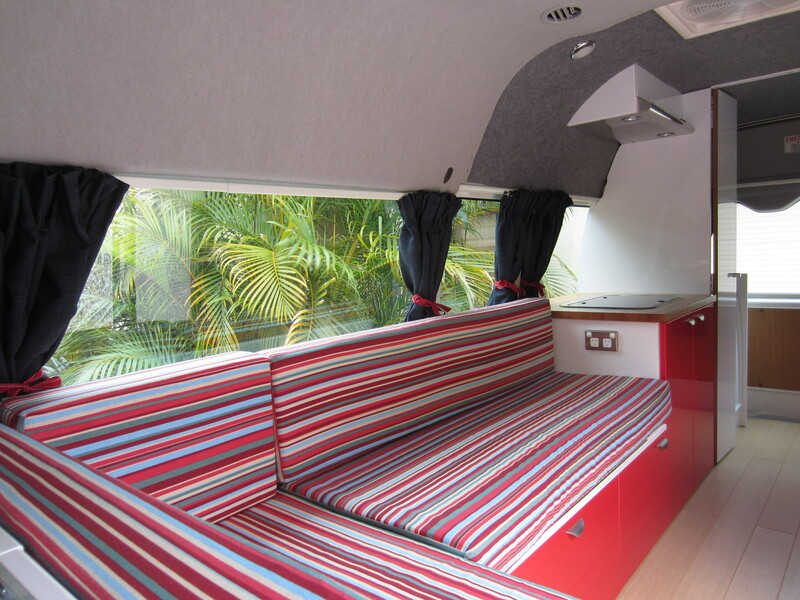 Fanastic campervan, excellent blog and great photography! You deserve a 10 year campervanning holiday! Thank you so much – I would love a 10-year campervanning holiday! Hey Rach and Paul… erm, wow. Anyway, we’ve just bought a Hiace, older than what your was and much tattier than what your was, but we reckon we can clean it up. We got two young kids, so we’re getting seats fitted in etc…. Can’t see any reference in the blog, but what is the glossy partitioning made of here in this pic? Hi Drew – thanks for your comments, I’m sure you’ll have great fun with two kids in there as well. For the partition doors – and for all the white gloss sections – we cut down some ‘pantry doors’ which are sold in Bunnings (I thought we bought the entire stock at our local store). It turned out to be a cheap and readily available form of gloss MDF. Great. Thanks for replying. Have a great new year. Hi Rachael & Paul – a fantastic job! I’m looking at doing the same sort of thing with the exact vehicle, but likely nowhere near your quality! Haven’t bought the van (KDH223R Commuter) yet, but I’m having a devil of a job trying to get an idea of internal dimensions! I need to plan my bits and pieces which I want to install, and if you guys have measurements of the seat-less interior, that would be a great help to me! If you have internal dimension data, I would be so grateful! Hi there – oh, I’m sorry – it seems I didn’t actually blog about the dimensions so can’t find any record now of what they were. Hope someone else can help, enjoy the planning!